Automation (or automatic control) is the use of various control systems for operating equipment and other applications with minimal or reduced human intervention. When is it okay to remove the human element? There are many tasks that can be handled more efficiently by an automation system than by a person. An effective automation system can streamline processes that often get pushed down on a person’s priority list. Customer Service Automation is the use of various control systems to operate software and applications providing customer touch points with minimal human intervention. Why should you automate some of your customer service processes? How effective are today’s Customer Service Automation tools? While there’s no all-in-one customer service automation software available, there’s a noticeable trend in emerging customer service tech. 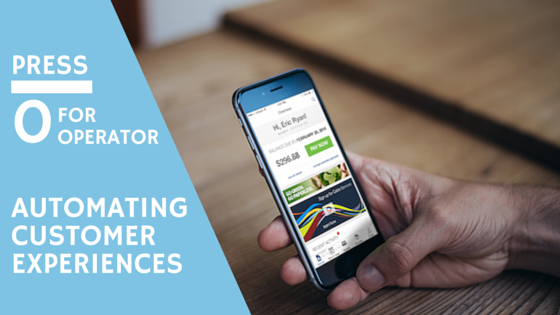 The most innovative customer service applications emulate customer service representatives. These applications utilize video to present a visually engaging and personable customer experience. While most customers prefer to find their own answers through a quick Google or site search, when search results fail, today’s customers prefer speaking with an actual representative. We suspect this preference supports the focus on emulating or integrating human interaction in customer service technology. Originally designed to quickly connect customers with the right support department, automated call menus have become a customer service standard. When done well, an automated call menu quickly provides a set of options that intuitively connect you to the right person. The option to “press 0 for operator” is readily available in case any of the menu options don’t seem to fit the reason for your call. But more often than not, automated call menus are poorly executed. Instead of efficient operator replacements, automated call menus have become never ending labyrinths of frustration. We’ve given automated call menus a Customer Service Automation score of 1 because they’re automated but not often personalized and engaging. Most call menus today seem to bide time for a customer service representative or deter people from calling for support altogether. We don’t view automated call menus as an ideal customer service automation solution unless you take the time to research and map out your customer’s call menu journey. Live Chat has quickly become a website must have. In some cases Live Chat can be automated by providing automatic responses after prompting customers to answer a predefined set of questions (similar to automated call menus). But the best Live Chat customer service sessions are those manned by actual people. Google chat representatives even use smileys and exclamation points to create an engaging voice during their live chat support sessions. If you’re looking for a low cost way to make your customer service team conveniently available to customers, Olark, Velaro, and BoldChat are some of our favorite Live Chat applications. Remember the key to customer service success here is ensuring you’ve educated your Live Chat team on your company voice, values, and products. If only we could all offer Mayday Buttons to our customers. When Amazon announced the Mayday Button, they threw down the customer service gauntlet. Instant access to a pleasant, efficient customer service rep became more than a proof of concept, it became a reality for all Kindle Fire owners. Did you know that people conduct more than 3 billion searches a month on YouTube? If customer service automation tech was on par with customer expectations (convenient, intuitive, simple), most customers today would prefer not to speak with a representative and find the answer on their own. Think about it – what’s the first thing you do when you have a question? You Google it. Imagine finding the answer to your question among the top search results in a visually engaging format. Problem solved in a moment and it was easy to follow. Perfect! Warby Parker has taken steps towards providing customer answers via YouTube by providing at-home try on consultation videos for individual customers. In fact, they’ve created a separate YouTube channel for customer support called WarbyParkerHelp. While this process can’t be completely automated, it still represents a huge step forward for digital customer service. Warby Parker recognizes where its customers often spend their time (YouTube) and provides them with personalized tips, available for viewing at each individual’s convenience. 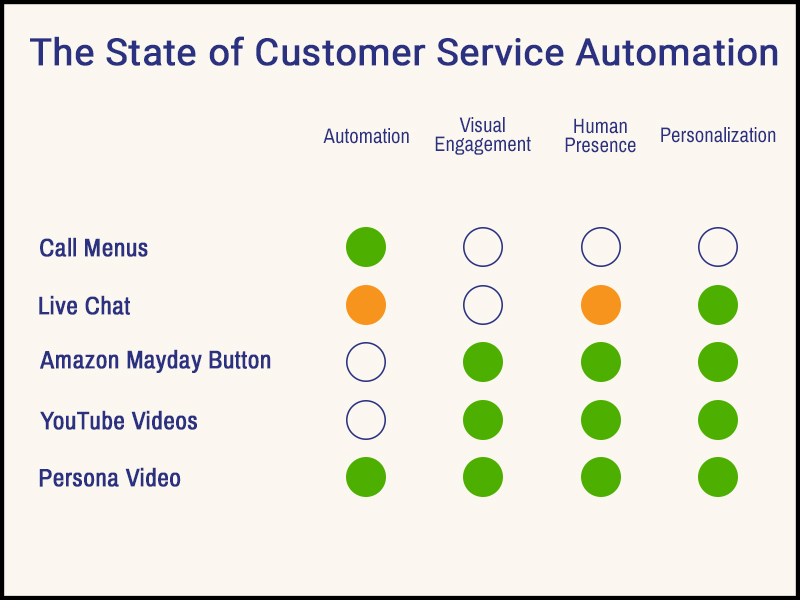 We’ve given YouTube Videos a 4/5 for Customer Service automation because, again, this covers all the bases of today’s customer expectations but is not yet a fully automated process. Persona Video by Sorriso™ and its emerging competitors are pushing the bar for customer service automation even higher. As a personalized, interactive video explanation, Persona Video automatically combines advanced customer data with pre-recorded rich video content. The result is a simple, specific, and engaging response to possible customer questions before they’re asked. Imagine utilizing the wealth of data your company stores for each individual customer to identify trends and irregularities. Then, using your pre-existing customer portal, you’ll deliver a personalized video message to an individual customer before they even reach for the phone. It’s like taking the Mayday button and automating it with some algorithmic handy-work. How has automation helped you? How have you streamlined your customer service efforts? Have you been able to successfully automate any parts of your customer journey to satisfy your customers and support your customer service team? 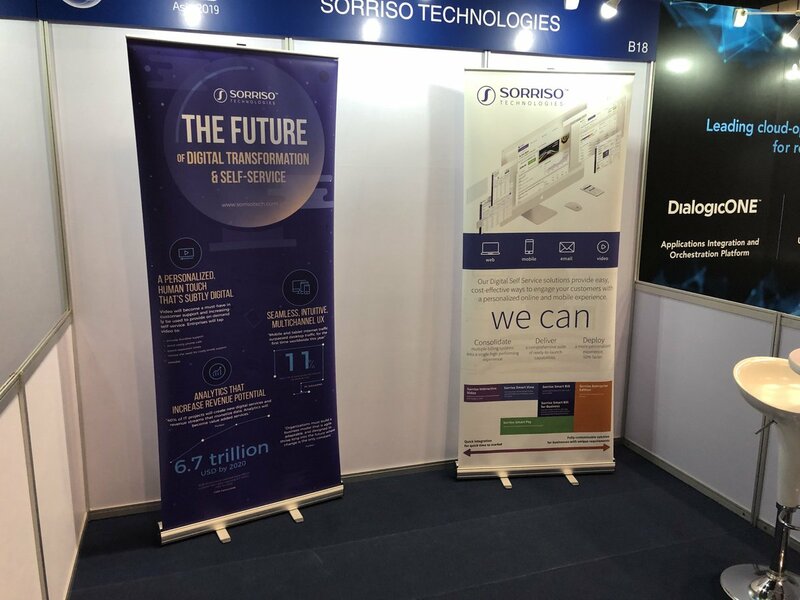 Let us know on Twitter @SorrisoTech. Join the user experience revolution today! We've been helping some of the world's leading companies provide their customers with simple, convenient digital self-service experiences since 2001. From interactive online billing to payment portals, to multichannel customer communications, to personalized videos, we've mastered digital self-service software for the smallest individual accounts to the largest business accounts.